Yellow Wind, a ’66 Kombi named after a Kioawa Native American horse, and I fly again. Highway 395 calls me to places like Bickel Camp, Lone Pine, and Manzanar. Shown here, the bus sits near a beef jerky stand south of Diaz Lake. 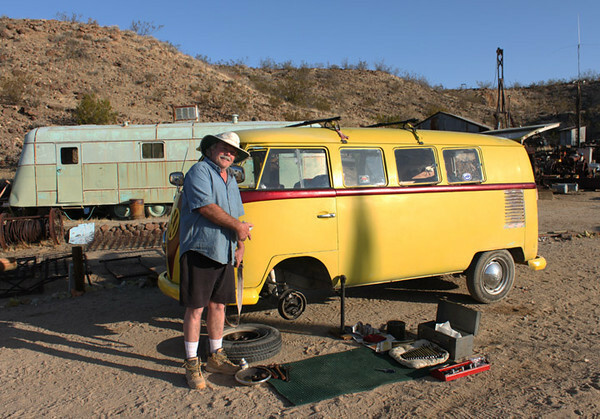 I first bought the bus in 1972 to replace my first VW van, a 1959 panel. In 1976 to earn 4 units of journalism credit at CSU, Fullerton, we took an epic voyage on the back roads of America in Yellow Wind. This name was rather more of a jest as it was my habit at 40 mph you yell out “Fly Yellow Wind, fly!” The name was taken from a winter-count robe told of in the Time-Life series on the West called The Indians. When I first bought the bus it was gold and was originally called The Golden Dart. My first wife, Diane and my son Billy traveled about the country on many trips to Mexico, and back and across the states many times. The Journal written in 1976 had a working title of “Yellow Wind—The Journey,” as I recall. I kept the travel log on reporter’s notebooks and filled several with interviews, and features about the people and places we met along the way. I used a Citizen’s Band radio to talk to truckers, farmers on tractors, and hippie cult leaders soaking in hot tubs under pyramid power structures. The journal was never published, but was strangely echoed in the 1980’s bestseller and great American classic “Blue Highways,” by William Least Heat Moon. Moon traveled the blue or back highways in a van called “The Grey Ghost.” I did type 30 or so pages of the journal and finally managed to convince my university adviser to accept this sad offering for the needed credit. Since then the journal has been in a dark box, waiting. I now plan to go back and visit that journal and type in into digital format. I’m restoring the bus on the road and make some of my first journal entries in the Bus’ journal since the last in 1976. This gallery will eventually serve as a place to post images and thoughts as I continue to travel. In Orange, Ca now, I work on brake and oil-leak issues. I plan to depart soon for a longer shake down cruse to Texas. Sharing an Eastern Sierra spot with three distant campers makes the Diaz Lake campground a real estate bargain at $25 this afternoon. I’ve limped in with the old bus to re-grease the front end and check on my Bickel Camp patch job on the brakes. Still, the trip has been magic. Five Rainbows wait in my ice chest for my trout roasting skills. I consider the amber lake light over a sip of Jack black. Cheers to Bob and Kevin at La Coste’s VW shop who laid talented hands on the old bus that flies me to this moment. Thanks to Eddie and Dave's Garage for rare VW parts. Raised glass to sister Mary who is helping Analissa down in Apple Valley with her senior quilting project. Having left the girl child there and son Daniel at home for school, I travel alone among old and new friends along a rambling path. The Hattendorfs, Bickels, and Horn families all spent a sweet Easter camped together at Bickel Camp. I met Glen, the caretaker there, and ex Navy Seal who amazed me by shooting a golf ball off a fence post at an incredible distance. “How far was that shot young sailor?” I asked Glen who nailed the ball in the center in dim twilight. “That was 500 yards sir!” We had taken to talking to each other nautically as we exchanged our Navy stories. I think of his 75 confirmed kills and of dead pirates and a vanquished Bin Laden. I remember telling him that his war demons will always be with him, so he has to come to terms. He struggles with this. “Damn good shooting,” I say. Carry on young warrior. Here-here to John Pearson, a Central Valley farmer I met at Bickel Camp at the gold miner’s meeting. The good doctor grows medical herbs, and is generous. Man pulls in the camp and asks if I’m Bill Gann. “Guilty as charged,” I say, wondering how he knows me. “I have something that belongs to you,” says the lanky man with a floppy hat and black mustache. I jump out of my folding chair to greet the visitor and he hands me my wallet. It seems I had left the billfold at the self-registering station, and a good man found it. I never missed it. Ron from Stagecoach Nevada saves my journey from a tragic end. Line in the water as the sun sets, I ponder a trip to Texas.